I invited the Converse low-res MFA students and graduates to share a favorite poem (or two) in honor of National Poetry Month, which is every April, and I am loving the passionate responses I received. Please, everyone, all of us, don’t think of poetry as something exclusive to a special occasion or something to endure to pass an English class or something to make a bit of a fuss over each April…think of poetry as Kafka thought of books: “A book must be the axe for the frozen sea within us.” A single poem can wield that force. Keep reading, and you will see. 1. I love lists as a form for poetry or prose. 2. I am afraid of being forgotten. That Sarah Cooper's poem is an act of remembrance, of leaving something behind in someone's honor, affects me deeply. 4. The smallest things become sacred relics after a loss. For me: Aunt Sally's mittens. Sweaters knitted by Grandma Mary. Granny's recipes. James's collar. Jaime's ballet shoes. Tapes from our old answering machine. Cards and letters and emails and photographs. 5. I have seen eroded headstones and sunken grave markers. Even when "permanent markers" fade, there will still be love. This is sad and beautiful and true. *from David Wagoner's "Plainsong for Everyone Who Was Killed Yesterday"
Lauren Housman is a writer, transcriptionist, editor, and budding historian. She is currently working on a World War II-era biography. She holds a BA in Language Arts and Literature with a concentration in Writing from the University of South Carolina (Aiken, SC) and an MFA in Creative Nonfiction from Converse College's Low-Residency MFA Program (Spartanburg, SC). “Pink Hollyhocks” tells the story of a miner's wife and a quilt that is the "onliest pretty thing" she owns. When I read the poem, it was powerful enough to nearly knock tears out of me by weaving together character, setting and pathos. Fisher solidly grounded me in time and place while nailing the narrator’s voice with words like “onliest” and “feedsack,” or lines like "I quilted every inch, stitches no bigger than a speck of meal." And then those closing lines. All of this despite a word count clocking in at just a shade over 250 words. Stunning. Travis Burnham teaches middle school science and has taught college level composition. He currently lives in Upstate South Carolina with his wife, but he grew up in Massachusetts, is from Maine at heart, and has lived in Japan, Colombia and the Northern Mariana Islands. He has been published in South85 Journal, Aoife's Kiss, Bad Dreams Entertainment, and SQ Quarterly, and has an MFA in Creative Writing from Converse College. travisburnham.blogspot.com. I first heard this poem in high school. My determined AP English teacher read it from the front of the class, sitting on a stool, in his distinct, raspy voice, lingering in all the right places. Even though I was too young to grasp all of it at the time, the imagery of fog as a cat and the tripping, lyrical lines were enough to pull my attention from the cute boy next to me and the catty girl behind me. It was enough to hold my attention and make me wonder. Its repeating lines and echoing phrases have inspired my own poetry for many years. My favorite lines come to me every time I walk upon the beach, or when I dare to eat a peach. I will most likely insist my children inscribe "She measured out her life with coffee spoons" on my tombstone. Gwen Holt is an MFA student at Converse College studying YA Fiction. She is the author of two steampunk novels for young adults and a senior editor at the Hugo nominated webzine, Quantum Fairy Tales. The way I know a poem will stay with me forever is when I have a physical reaction to it. It makes me smile wide or it makes me clench my fists or it makes me squeeze my eyes shut tight. “Cut Lilies” by Noah Warren makes me fight to breathe. The description of the physical presence of the “hundred dollars” worth of lilies in one room is cloying. It fills my lungs: “And in close darkness the aroma grows so sweet, / so strong, that it could slice me open. It does.” And then, when the scent of the flowers seems inescapable, when the loneliness they indicate seems overwhelming, suddenly the speaker is outside. You might think that the fresh air would offer relief, but no. “I’m not the only one that love makes feel like a dozen / flapping bedsheets being ripped to prayer flags by the wind.” My breath catches on these lines, every time. 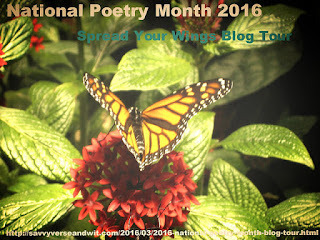 Gabrielle Brant Freeman is currently making herself crazy and enjoying every minute of it trying to write a poem a day for National Poetry Month. Her first book, When She Was Bad, will be published by Press 53 in the fall of 2016. I've read this poem at least 100 times and it still gets me the same way. I love the "come close, I want to whisper it" part. It's so intimate, just drawing the reader in until the speaker is confessing his/her innermost thoughts to only one person, the reader. I could go on and on and on about this poem, but I'll spare you. Yeah, definitely this poem. David Colodney holds an MFA in poetry and creative writing from Converse College, and has written for The Miami Herald and The Tampa Tribune. His poetry has appeared in Gyroscope Review, Kentucky Review, Night Owl, and others. He lives in Boynton Beach, FL with his wife, three sons, and golden retriever. My favorite undergraduate English professor, Ed Sims, introduced me to "The Emperor of Ice Cream," the now classic lyrical poem by Wallace Stevens. The entire poem zings, buzzes with dynamic language, and I particularly like: "...and bid him whip in kitchen cups concupiscent curds." To me, the content of the poem stands in bold contrast to its title, and I love the effect. John Newlin is a third semester MFA student in fiction writing at Converse College. He taught English at Eaglebrook and Tower Hill Schools, where he was also the Head of Middle School. He writes reviews for Nightowl Journal and serves on the editorial staff of South85.